Tickets to high-tension thriller Stop and Search at the Arcola Theatre are now on sale! Written by award-winning, Irish-Nigerian poet Gabriel Gbadamosi and starring Munashe Chirisa, this Arcola Theatre production is the show to watch for 2019! Stop and Search stars Muncashe Chirisa as Akim, Tyler Luke Cunningham as Lee, Shaun Mason as Tel, David Kirkbride as Tone, and Jessye Romeo as Bev. Set in a political climate where tensions are high and populism is on the rise, Stop and Search follows a driver who picks up a young male hitchhiker who is making his way across Europe. When a surveillance case is investigated, a debate erupts on cultural identity and police state corruption. This edge-of-your-seat play marks the first work of Gabriel Gbadamosi's to be performed in London. It will be directed by the Arcola Theatre's in-house artistic director, Mehmet Ergen, who is perhaps best known for having directed Richard III and The Cherry Orchard for the Arcola Theatre and King Lear for the Southwark Playhouse. 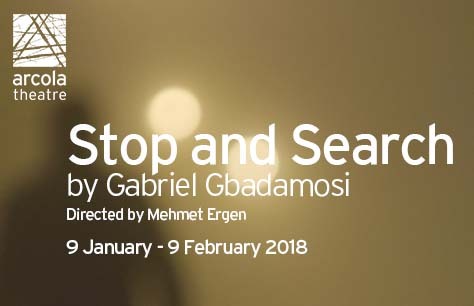 Don't miss Gabriel Gbadamosi's edgy new piece Stop and Search, which premieres at the Arcola Theatre this New Year! Book your Stop and Search tickets now for the best seats at the Arcola Theatre!